Sharon Kivland. Freud on Holiday. 8 illustrated vols., with b/w ills. Prices below are in pounds sterling. Order online at www.cornerhousepublications.org. For details, write to publications@cornerhouse.org. Vol. IV. Sharon Kivland with Lucia Farinati. A Cavernous Defile—Part 1. Foreword by Forbes Morlock. York, UK: Information as Material, and Athens: Cube Art, 2013. 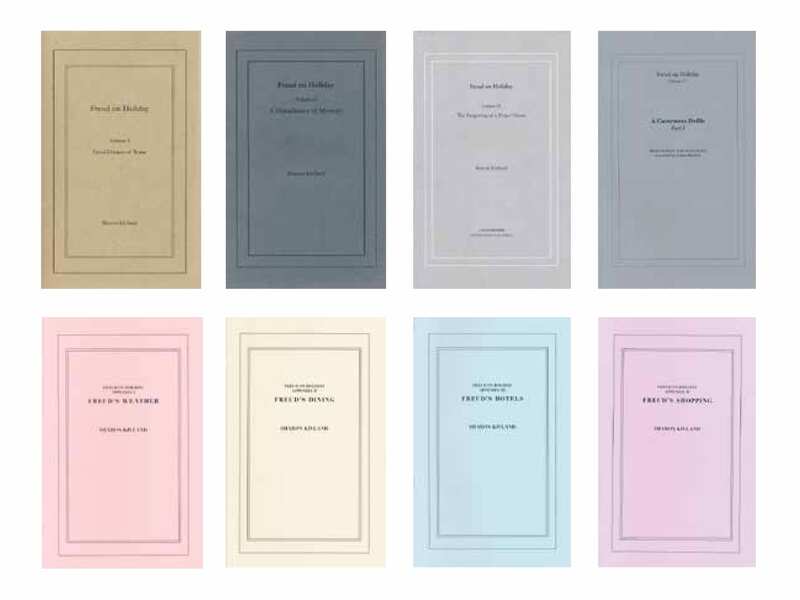 Sharon Kivland’s suite of eight books, Freud on Holiday, is an account of her absorbing project of understanding what may be known of Sigmund Freud and of what may be thought of through Freud as “oneself,” in this instance, by taking his holidays as reconstructed from his psychoanalytic writing, letters, and biographies, and the memoirs of others. Kivland’s compelling travel narratives are presented through the devices of certain conceptual art (raw accumulation of information, resolutely low-resolution black-and-white images)1 and the restrained covers that evoke Samuel French professional editions of plays. Kivland draws oblique attention to the ethos of self-theorizing authority latent in these moves, as if October were putting out a stocking stuffer. These nimble, erudite books take the form of apparently breezy and matter-of-fact narratives, and at the same time snag the reader on almost overlooked ironies and feints. Kivland offers insidiously poignant insights both into the ambitions, false starts, and hesitations that dogged Freud’s travel itineraries and intellectual trajectory, and into her own ostensible project, which (again, ironically) disguises itself as a biographer’s quest for explanations or origins in the life lived. Kivland does not present Freud’s holidays chronologically, but reconstructs them around states of Freud’s mind in certain places: a dream of Rome, a feeling of melancholy in Trieste, a disturbance of memory in Athens, and the navigation of the “cavernous defile” (of actual mountain climbing and of the unconscious in dream). Where Freud visited the same place several times, separate incidents overlap as one state of confusion or memory lapse inflects another, and as Kivland elides her experience, her own Reisemalheurs, migraines, and “occasional mild depression,” with Freud’s (IV:18; references are to volume and page number, though some shorter volumes are not paginated). This points to the questions: By what authority may one know how Freud felt or what he meant? What possible revisitation or reenactment could induce a duplicate or similar state of mind? And, in any event, can a state of mind be modeled? Kivland lightly but intensely models the ways in which Freud has so shaped our understanding of thought that Freud can only be thought through Freud, on Freudian terms. Kivland draws attention to the misalignments inherent in her reconstructions: her son (who is also, enigmatically, her nephew), her sister, and her proxy Lucia Farinati must substitute for Freud’s travel companions, his wife, sister-in-law, brother, and children. She is thwarted by the intervening century, changes in transport, timetables (Freud’s holidays are incompatible with her son’s school holidays), hotels and buildings no longer there, and so on. Even if she got to Dubrovnik, she wryly points out, how could she arrange an “encounter with a stranger, whom I hoped would prove to be a lawyer, with whom I would discuss ethnic conflicts, politics, the customs of Turks living in Bosnia (the high value they placed on sexual enjoyment and their resignation to death), the magnificent frescoes in the cathedral at Orvieto by the painter whose name I would have forgotten?” (III:24). Warping temporalities and ill-fitting actors—and the fact that Freud was on holiday and Kivland is not—create a sense that Freud’s travels have become Kivland’s own screen memory. That serves her quest, which, Craig Saper says in his introduction to volume II, may be “simply put,” as finding the unconscious while on vacation (II:10). That is a deliberately disingenuous quest, because neither vacations, as being not at home, nor the unconscious can be “simply put.” Kivland’s narratives are complex divagations that take walking as the operative metaphor for narrative structure, quests, and unconscious mental processes as described by Freud. The first book of the series, Freud Dreams of Rome, begins with Anna Freud’s 1948 dream that her father was wandering around lost. Although she was occupied with other things, he called to her. She felt obliged to stop what she was doing to go out walking with him; and yet she resented his call. This is one walk that models Kivland’s own path, structured by the detours, impediments, and mechanisms of substitution, displacement, and overdetermination operating in the Freudian unconscious. When Kivland tells us that her own writing is neurotically inhibited, her inhibition is informed by, even necessitated by, Freud’s observation that “both writing and walking are stopped because they represent the performance of a forbidden sexual act.”2 Kivland dryly observes, “As you can imagine, this has given me tremendous difficulties in completing this paper” (I:1). That this particular passage is also found at the end of Jacques Derrida and Jeffrey Mehlman’s essay, “Freud and the Scene of Writing,” points to another inhibition, which is that intellectual precedents and referents, like associations in the unconscious, are endless. Another narrative frame arising from Anna Freud’s dream is a sense of inertial undoing: “It is as if a renunciation or a form of progress has been undone because she has been called” (I:1). That double direction or stalling is developed in Derrida’s account of the rhythms of Freud’s writing, which, in the sway of the death drive pulling the organism back to an preorganic stasis, “mimes walking, does not cease walking without advancing, regularly sketching out one step more without gaining an inch of ground.”3 Kivland will declare that her writing too is prone to this movement that “caused no movement” (IV: 42). Her prose runs to long recursive sentences and passages that often end in a kind of retreat: “I still do not understand what he meant” (II:87). When Kivland gives a sustained description of Freud’s early, ungratifying, smelly work in Trieste, dissecting eel after eel in the search for the testes, and in search of his own distinction as a scientist, it works as an allegory of the same problem of progress (II:31). Kivland’s project, as a digressive quest narrative, like the irretrievable eel testicles, is both futile and fertile. Kivland writes ingeniously self-declared borrowed voices, humorously, movingly, and conversationally, with self-interruptive anxieties: “What? —oh yes . . .” she blurts, as if ventriloquizing the Rosalind Krauss of The Picasso Papers (I:4). We hear the off-kilter ingratiation of tourist brochures (“Oh, it is a precious and intimate ensemble that makes guests feel that they are in a private residence,” III:11), or the flattering, urbane voice of advertising that slyly frames Louis Vuitton as copublisher of Derrida’s Counterpath (the target audience might profit from “a series of travel scrapbooks so memories will never fade, illustrated by renowned artists to capture the atmosphere of their chosen cities and containing some blank pages for personal notes and impressions,” III:8). We hear the academic grant applicant justifying the methodology of her exigent “holiday work,” well aware of the predetermined “outcomes” demanded by bureaucracy. Kivland attends to prose rhythm: where things are most close to the bone, she tactically moves to cantering point form, as if to get past the difficulty: “After Anna’s birth in 1895, sexual abstinence was the only answer: his pleasures were limited: he was not allowed to smoke anything decent and he was done begetting children” (IV:43). One effective device is the use of adjectives so generic as to evaporate descriptive force, in the manner of holiday postcards or tourist brochures: “lovely,” “enchanting,” “wonderful,” “attractive,” “splendid.” These failing adjectives may point more gravely to language’s failure to be adequate to any given situation, to fall into numb euphemism, as in Freud’s observation that the death of a father is “the most poignant loss” (IV:17). The problem of establishing a persuasive authoritative voice is worked through in Kivland’s long expository tangents freighted with information. The intelligence of this tactic is that the evidentiary value of facticity is undermined by the sheer accumulation of facts. If Freud’s children return from an excursion with burrs, twigs, leaves, insects, and snails stuck to their loden coats, Kivland will give a detailed technical description of loden’s manufacture (IV: 28–29). There are similarly excurses on the implications of wildflowers, mushrooms, walking sticks, and trains. Where these seem tangential—what does the manufacture of loden have to do with it?—they are most pertinent: a psychoanalyst might well be drawn to the phallic “fuller’s teasel,” that “prickly flowering plant with a cup-like form made where the sessile leaves meet the stem” used to brush loden, and to its shaved nap, as she well knows (IV:29). Folk costumes and uniforms and their accessories, as worn by Freud’s children, by Kivland, by her traveling proxy Farinati, and by anonymous locals in tourist postcards, crop up throughout. Although now a “costume of tourism and beer gardens” (IV:30), they generate an uneasy psychosexual undertow of the seductive völkisch nationalism (the “attractive” embroidered laces of her son’s lederhosen) that accessorized uniformed Fascism, and of the anti-Semitism that refracted Freud (here) as wandering Jew (IV:31–32). Kivland’s seemingly and intermittently obsessive, circling descriptions of things always yield something of Freud. When she points out that a dirndl for holiday photographs may now be rented, and that “hourly rates are also available” (IV:31), that hourly rate points to measured time. Time erupts through these narratives, inflected by Freud’s own grappling with the delays and deferral between present perception and the filtration of the mnemic system with its traces and erasures, and with the difference between time in the unconscious and conscious.4 To condense one of Kivland’s characteristically veering narratives: Taking a wrong turn on the way to the Freud Museum in Vienna, she found herself in a street that she realized she had been in once before when writing her first book about Freud’s “Dora” case, and then recognized the Hotel Orient where part of the film The Third Man, based on the novels of Arthur Schnitzler, was filmed. Freud approved Schnitzler’s insights into sexuality. (Kivland points outside her text at every turn: we might add Schnitzler’s Reigen, structured as a round of sexual encounters, beginning and ending with the same “whore.”) The Hotel Orient, she tells us, opened in 1896 as a maison de passe, renting rooms by the hour. That paid hour is refracted by the metered hour imposed by technological modernity and railway timetables, horaires, which are echoed in the strict psychoanalytic hour that meant to signal a conscious scientizing rigor in approaching the unconscious, in which the past covertly governs thought in the present. Kivland reminds us that the French railway crossing sign, un train peut en cacher un autre, pertains in the unconscious (IV:66). In machine modernity, a train timetable hides something unruly that disrupts the train of thought. While it is impossible to encapsulate Kivland’s accounts of Freud’s different incidents and travels, Rome is a key case, beginning with Freud’s frequent postponing of his journey to the city, which he dreamt about four times while working on The Interpretation of Dreams. Kivland’s photographs of Rome are inscrutable, not the received angles on monuments and vistas that the proto-tourist might imagine. It is as if we were near but not yet at what we mean to see. (The outmoded technique of gluing in the photographs enhances the sense of something archaic or uncanny in the photographs themselves.) Rome functioned in a peculiar way for Freud, as its secular classicism was a bulwark against the Rome of Christian anti-Semitism (I:5–6). In keeping with symbolic representations in the unconscious, Freud’s Rome is overdetermined by other towns and cities he visited and dreamt about (Paris, Siena, Trieste), and by other voyagers (the classical Ulysses, Leopold Bloom) and writers (sometimes Jewish) associated with them (Italo Svevo and Umberto Saba, as well as James Joyce), brought together in a snarl of correspondence and coincidences. Cryptically interposed through Freud on Holiday are drawings, tourist and childhood snapshots, personal and anonymous, from the truly poignant to the unnerving: everyone looks like a revenant in an old photograph, but now with an accrued, knowing chic. That is, Kivland is the master of wrenchingly unstable tone, pulling the mat out from under our positions at every turn. There are also postcards and the texts of postcards sent to Kivland from her unknown correspondents in the elliptical manner of the genre. The postcard chapters are called “envois,” engaging with Derrida’s metaphor of the post office that transmits or stores all texts, reconfiguring history, and disrupting chronology, cause and effect, and precedence. In the postal, everyone is a facteur de la vérité transmitting and recasting narratives from her own particular unverifiable perspective, and when Kivland invites the artist Farinati to be her proxy on Freud’s holidays in northern Italy, it is as a facteur de la vérité (IV:73). As walker as woman as follower Kivland situates herself within Derrida’s investigations of psychoanalysis, and within his argument with Lacan, involving suppression of sources, questions of legacy, and the role of woman as and as not phallus. Where Derrida countered Lacan’s logocentric claim that “a letter always arrives at its destination” with the necessity that a letter “always might not arrive at its destination,”8 Kivland negotiates the conflicting predecessors: she would like to believe that a letter or postcard always arrives at its destination while being “haunted” by the idea that it may not (II: 45). Her postcards shuttle texts and temporalities to frame her “following” (both in the sense of coming after, and of comprehending what is being said), treating her quandaries with light ironies. Freud on Holiday is a test case of following, amending, acknowledging, and perhaps losing the plot of what has been written before. Kivland’s position and voice as a woman is always at stake: she moves in and out of the positions of women actual, literary, mythic, imagined—Anna Freud, Antigone, Lucia Joyce. She traces the difficulties of a quest or narrative undertaken by a walker, especially Anna Freud, who, as a psychoanalyst, was the only one of Freud’s children to fulfill the metaphorical “walking in the footsteps of.” But Kivland’s Anna Freud is also Anna Freud as questioned by Derrida through Yosef Hayim Yerushalmi—more forest of authors—who had asked whether Anna Freud could in fact speak in her father’s name.9 (Freud had not wanted psychoanalysis to be “Jewish,” but rather a universal model of the mind; yet after the Second World War Anna declared that it was an honor for psychoanalysis to be considered a “Jewish science.”) Who may speak for whom? By what authority could Anna Freud, not only as Freud’s daughter, but also as a woman, speak even for herself? Kivland refers to her own “impossible reconstructions” as “an act of ventriloquism,” but hopes that there is more at work than simply “an imitation of speech and voice, an empty parroting” (IV:18). Yet arguably the parrot’s version is already a modification, a Derridean lacuna. In A Cavernous Defile, Kivland identifies with the “Gradiva,” a Roman relief of a woman walking with a peculiar high step, graceful and forceful. That relief was transformed in Wilhelm Jensen’s novel Gradiva (1903) and in Freud’s long analysis of the novel, so that Gradiva became not so much an active walker as a hallucinated, misrecognized object, a consequence of repression and male desire. Could Kivland’s walking possibly reclaim Gradiva’s self-possession? When Kivland concludes that she will go back to Rome “as Anna and Sigmund,” but “above all” as herself (IV:132), we want to imagine that Kivland has worked through, or walked off, whatever inhibited her. Through Kivland’s writing there is a graver undertow of mortality than that afforded by four hundred dissected eels: in the cryogenic pall of postcards and photographs, in Freud’s theme of dead fathers, which now include Freud. As we read, models for narrative structured like the unconscious accumulate, from the weird looping ribbons of eel testicles to the branching threadlike spread of mycelium (given Freud’s love of mushroom hunting). With the tragicomic incongruity of representations in the unconscious, these ribbons and threads overdetermine the spool in the famous fort-da game played by Freud’s grandson, who wished for his mother’s return: a spool is cast away and retrieved by the string, a child crouches down to make himself appear and disappear in the mirror. Freud’s account of the fort-da game became an act of his own devastating mourning. From the theoretical thicket—the cavernous defile, the forest—Kivland emerges into four little appendix books, Freud’s Weather, Freud’s Dining, Freud’s Hotels, Freud’s Shopping. Sometimes the accounts are Freud’s, sometimes Kivland’s, sometimes they are from hotel brochures. They are minor records and footnotes as the main story, setting up their own narratives, pleasurably taking the floor. She says she regrets not making an appendix book on Freud’s mentions of his intestinal troubles “to which I do not think I can devote an entire pamphlet” (IV:84). Here, the eel’s testicles find a looping counterpart. Kivland’s work yields Freuds—father, mushroom hunter, traveler, thinker, walker, writer—but, unlike one train concealing another, yields no concealed Freud. These compelling narratives do not tend toward one particular aha moment or devastating Derridean lacuna that might be plucked from the mise-en-abîme. Kivland’s enterprise could be contrasted with the more usual investigative procedure of the historian or biographer. For example, in order to fathom the causes of an incident of Freud’s forgetting a name and his persistent “Moses complex,” Franz Maciejewski retraced a holiday Freud had taken in1898 with his sister-in-law Minna, and discovered from an old hotel register that they had shared a room as man and wife. This has caused consternation in psychoanalytic circles. Kivland turns to the Minna question with oblique wit, noting that Freud and Minna were overcome by a “paralyzing weakness” in Innsbruck; and yet, she says, she will not add to the speculation on the subject of their relationship (IV:25 and IV:43). At the end of A Cavernous Defile, Kivland talks to Vera, the present-day proprietor of the hotel where Freud stayed. Unlike Maciejewski’s hotelier, Vera doesn’t have much to reveal that isn’t in the hotel brochure, except that “a man from Rome, a writer,” comes to stay in the hotel every year, and that he is writing a book about Freud’s holidays there (IV:115). Yet we know, thanks to Kivland’s oblique signals throughout, that whatever the aspiration or intention of this double may be, he too will never attain or become his object of study. A caution to us all. This review was originally published in the Spring 2015 issue of Art Journal. Elizabeth Legge (Department of History of Art, University of Toronto) has written on Dada, Surrealism, and contemporary British and Canadian art, including books on Max Ernst and psychoanalysis, and on Michael Snow’s film Wavelength. Most recently, her essay on Vera Frenkel’s The Institute: or what we do for love was published in Vera Frenkel, edited by Sigrid Schade (Hatje Cantz, 2014); and “Nothing, Ventured: Paris Dada” is forthcoming in the Blackwell Companion to Dada and Surrealism, edited by David Hopkins.